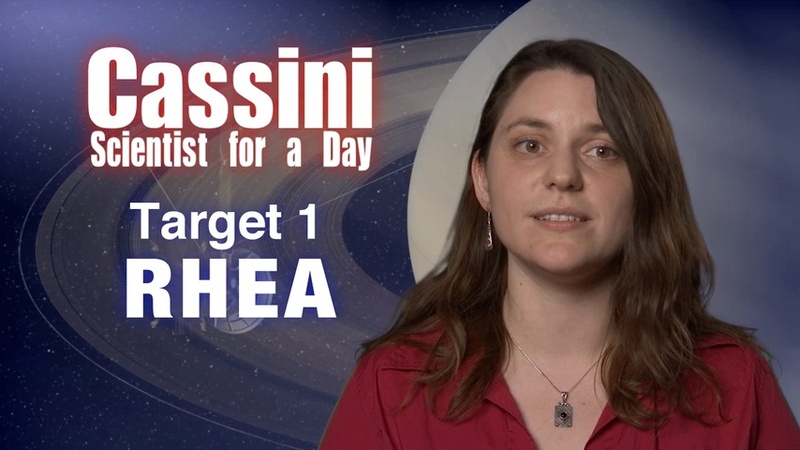 The Cassini Scientist for a Day contest is your chance to tell us where you think the cameras on Cassini should be pointed during upcoming observations. The NASA science planning team designed three possible observation opportunities. Each of the three has scientific merit, and in fact Cassini will image all three. Your assignment is to decide which of these three targets would yield the best science return – and to write an essay explaining your reasons and what you hope to learn from these images. The winning NZ essays will be evaluated by Cassini scientists and educators. There will be a winner for each target in each age category. Thank you for your interest in the Cassini mission, and good luck with your essays – we look forward to hearing from you! Rhea is a very interesting moon: one side is very bright and heavily cratered, while the other side has bright wispy streaks on a darker background, and fewer craters. It is Saturn's second-largest moon. It is unusually light for it's size, so we think it might have a lot of ice. One of the big mysteries of Rhea is whether or not it has rings. Observations by Cassini's particles and fields instruments of the region around Rhea show variations that some scientists think may be caused by very thin rings of dust around the moon. However, we have not been able to see these rings directly with our cameras, so other scientists remain unconvinced. In this observation, the Narrow Angle Camera will be pointed at Titan, Saturn's largest moon. Titan will be at the center of the field of view and Saturn's rings will also be visible, edge-on, near the top of the image. While this would be great in itself, the amazing thing is that two other very interesting moons, Tethys and Enceladus, will also be crossing the field of view during the observation! Cassini will take 66 images of this out-of-this world scene, allowing scientists to put together a short video of these three moons. I think Target 2 is the best observation because it includes three of the most intriguing moons orbiting Saturn, and a shot of the rings. Enceladus has active ice geysers that feed one of Saturn's rings. 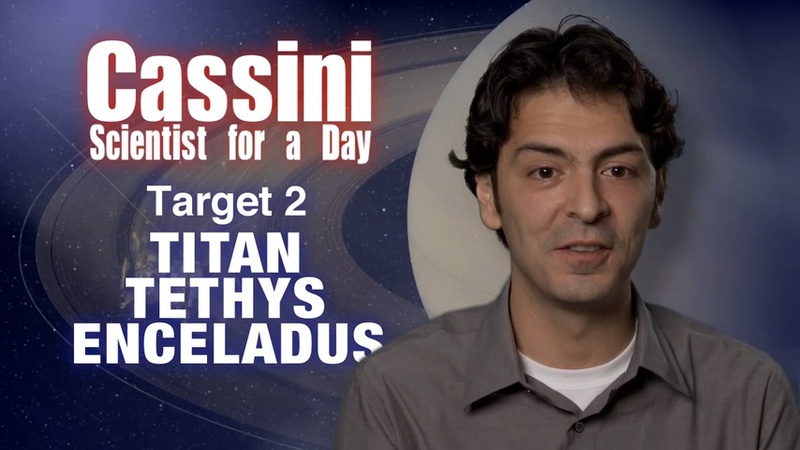 Target 3: A video capturing a day on Saturn. 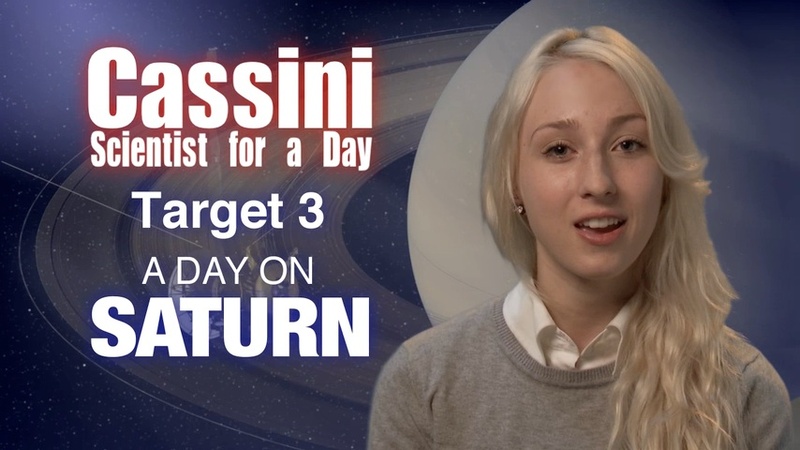 Target 3, a day on Saturn, is especially interesting because Saturn's rotation rate is unknown. The Voyager and Cassini spacecraft measured different rotation rates. Cassini has observed Saturn's rotation to be longer than the previously accepted value determined by Voyager. Furthermore, Saturn's interior rotation rate has not been directly measured, as there is currently no definitive way to do so. Saturn's rotation is also difficult to measure because its large hazy atmospheric features, including clouds and storms, shift with respect to each other. Over a 12-hour period, the Wide Angle Camera on board Cassini will be taking images every 27 minutes. These images will be used to create a 27-frame full color time-lapse movie, which will provide a detailed view of Saturn's full rotation.